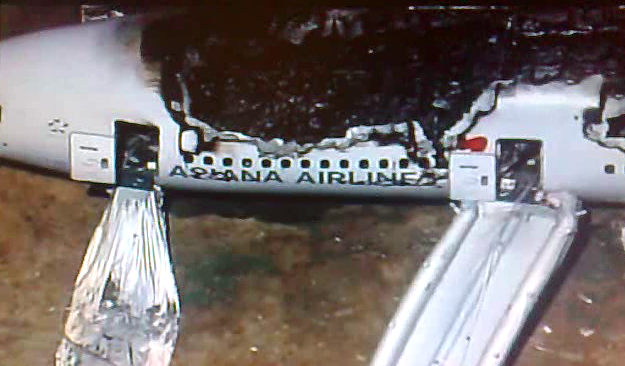 Home Unlabelled Asiana Airlines Boeing 777 Crashed on landing at San Francisco Airport;2 dead. Asiana Airlines Boeing 777 Crashed on landing at San Francisco Airport;2 dead. A Boeing 777-200 operated by Asiana Airlines crashed while landing at San Francisco International Airport, CA (SFO) on Saturday. Flight OZ-214 originated in Seoul-Incheon International Airport (ICN), South Korea. The airplane impacted the ground while attempting to land on runway 28L. Photos and videos from the accident scene suggest the tail separated and a fire had erupted. Occupants were seen evacuating from the airplane. The plane had 291 passengers and 19 crews. 2 fatalities have been reported and there are dozens injured, ten said to be critical. The 2 dead souls were found out of the plane and are said to be Chinese. Eye witnesses said it was clear Asiana Airlines flight 214 was in trouble as it approached the airport. it appeared to be coming in too short and may have hit the sea wall dividing the run-way from the Sun Francisco bay. The plane burst into flames shortly after it hit the ground with dense of black smoke pouring from the jet. Many of the passengers were quick to make their escape. The nationalities onboard included Chinese, South Korea and American citizens. Asiana is South Korea's second largest airline. The twin-engine B777 has a good safety record as a long-haul aircraft and is widely used by many of the major carriers. The plane was designed for a purpose of flying people from essentially one continent to another flying across either the Pacific or the Atlantic ocean and particularly to go more than six or seven hours at a time and comfortably. The B777 can get about 300 people onboard.